Utagawa Kunisada/Toyokuni III (1786-1865) Stories of the Faithful Samurai: Ichikawa Raizo V as Mase Kyudayu Masaaki (The Syllable Ne) 1864. Oban. This series was designed by Kunisada at the age of 79 in the year 1864. It seems to be the last of his great series on this subject. The 47 Ronin were arranged by the 47 syllables of the Kana-alphabet and shown in their last fight against their opponent, prince Enya Hangan, which took place at night at the beginning of 1703. Kunisada uses the nocturnal setting to great effect, contrasting the dark tones with the traditional costumes of the heroes. Although the use of real historical names for personalities living before 1572 was forbidden in 1864, all ronin are here given their original names and not their aliases which were used for more than 150 years in prints and other popular literature. The prints of the Loyal Samurai remain striking to this day; aided by the contrast of the traditional dog tooth design of the clothing (every version of the story benefits from the bold black and white scheme) and by the passion of the subject and the reverence with which the story was held at a time of open criticism of the Tokugawa government. 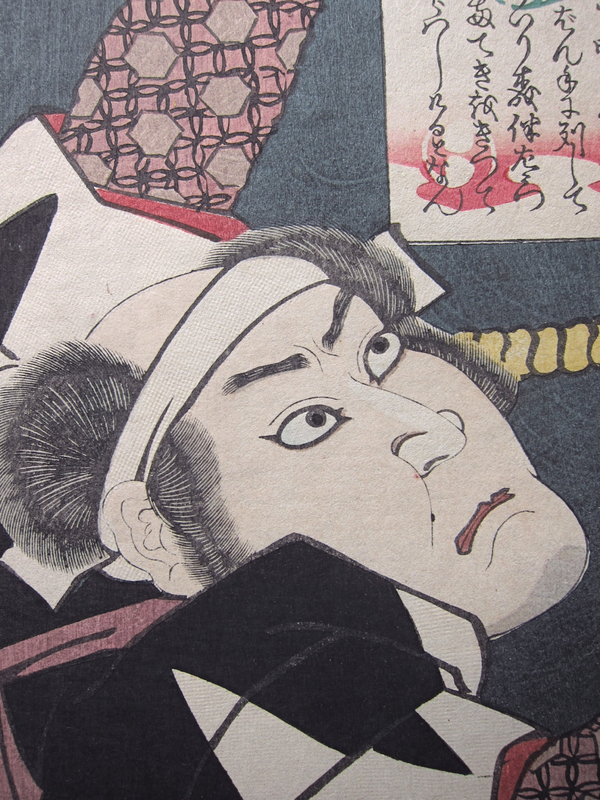 Ronin prints are essentially subversive - in part because the sentence carried out on the surviving members was overly harsh and judged to be wrong, and in part because they recall a Japan that was remembered for its honour and its values rather than the perceived decadence and weakness of the Tokugawa’s final days. 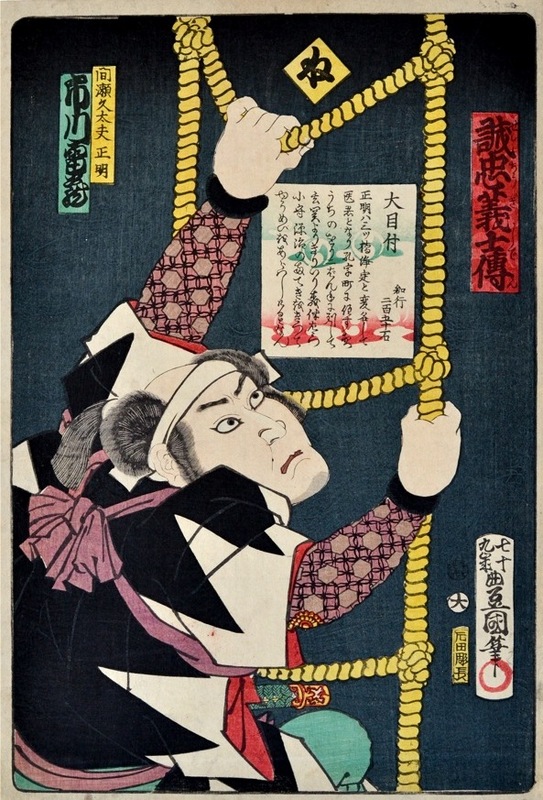 This is a very fine design, Kunisada using the device of the rope ladder to full advantage. Note how the primary cartouche is framed by the open rungs of the ladder, playing with the space… is the cartouche pasted on the back wall and the framing just coincidence? Or is it just a graphic device with no implied space? The placement of cartouches and other devices deserves much more study than they are given, this print is a good example of the spatial ambiguity they imply. Colour condition and impression are all fine. Signed nanajukyu sai Toyokuni hitsu (Drawn by Toyokuni 79 years old), published by, Daikokuya Kinzaburo.